Bhamo (Burmese: ဗန်းမော်မြို့ ban: mau mrui., also spelt Bamaw) is a city of Kachin State in the northernmost part of Myanmar, located 186 km (116 mi) south from the capital city of the state of Kachin (Myitkyina). It is on the Ayeyarwady River. It lies within 65 km (40 mi) of the border with Yunnan Province, China. 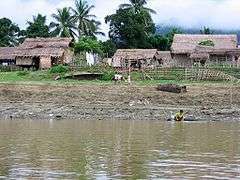 The population consists of Chinese and Shan, with Kachin peoples in the hills around the town. It is the administrative center of Bhamo District and Bhamo Township. Bhamo was an important trading post with the Chinese Empire up to the nineteenth century, when copper coins from China flowed into Burma via Bhamo. VOC (United Dutch East India Company) records identified these copper coins as an important source of profit, and also mention the presence of a Customs Office in Bhamo to regulate the border trade. From 1869 to 1879, it was the seat of British colonial Assistant political agent, subordinate to the Resident with the king of and in Ava. As of 1935, the town was situated at the highest navigable point of the river, and was the terminus of caravan routes from India and Burma, by which jade, in particular, was brought into China. Bhamo was once called Sampanago, the capital of the now-extinct Shan predecessor kingdom of Wanmaw. The ruins of the old city walls, dating from the fifth Century, are found some 5 km from the modern town. A once weekly Myanma Airways flight is available, as are three times a week river ferries. It is the terminus of river ferries from Mandalay. 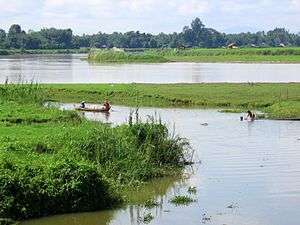 There is no river ferry between Bhamo and state capital Myitkyina. 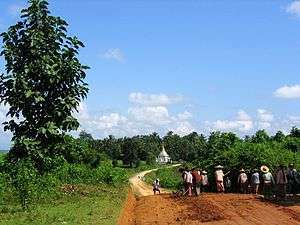 The land route between Bhamo and Mu Se District (Muse, part of Northern Shan State), is in poor condition. 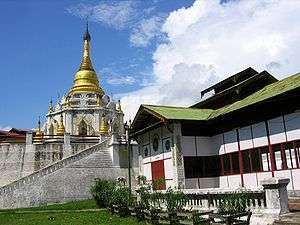 Bhamo is one of the official border trading towns between China and Myanmar. 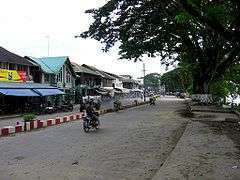 The town is home to Bhamo Degree College.And other chance been studied Engineering subject from Technological University(Bamaw),computer and networking subject from Computer University(Bamaw). Bhamo has a humid subtropical climate (Köppen climate classification Cwa). Temperatures are very warm throughout the year, although the winter months (December–February) are milder. There is a winter dry season (November–April) and a summer wet season (May–October). ↑ "Bhamaw Climate Normals 1961-1990". National Oceanic and Atmospheric Administration. Retrieved 11 January 2013. This may be out of date or biased to the timeframe of that reference. Wikisource has the text of the 1911 Encyclopædia Britannica article Bhamo. Wikimedia Commons has media related to Bhamo.